“Dance with the one that brung you” is one of the many colorful sayings that I enjoyed learning, growing up in the investments world of the 1970s. Among other things, it applies to how we decide when to buy and when to sell stocks. There are a number of reasonable investment strategies – investment as distinguished here from trading, which is a whole different kettle of fish…. One reasonable investment strategy is to buy stocks when they’re under-valued and sell them when they become over-valued. Another is to buy when the Dow Theory and PTI turn bullish, and then sell when they turn bearish. A third strategy could be to buy good quality stocks and hold them for many years, tapping into the market’s historical average return of 10% per year. Each of those strategies makes sense; each works in the long-run, if followed consistently. But investors usually lose when they mix strategies or otherwise don’t dance with the one that brung ‘em. For example – buying because stocks are under-valued, but then selling because the Dow Theory turns negative. Or buying with a 20-year time horizon, and then selling a year later because the market dropped 15%. Or buying based on a Dow Theory buy signal, then selling because the market doesn’t seem to be acting right. Doing so mixes apples and oranges. This is about the concept of following proper investment procedure. Staying true to your chosen investment strategy – whatever it may be – is as important as staying true to your girl or guy. Investors buying based on this being a confirmed Dow Theory Bull market and a positive PTI should sell only when that is no longer the case. To do otherwise would be like buying a beautiful ripe orange, and then throwing it out because it doesn’t make applesauce. And that’s what was behind my recommendation last week to NOT buy stocks if a drop in the market of, let’s say 8%, would prompt you to sell. Since Richard and the Dow Theory first labeled this a Bull market in August, 2009 (DTL, Letter # 1461), the Industrials have risen about 5500 points, or 60%. Some interpretations of the Dow Theory indicated an end of the Bull market in July, 2011, by which time the Industrials were already up about 2000 points. 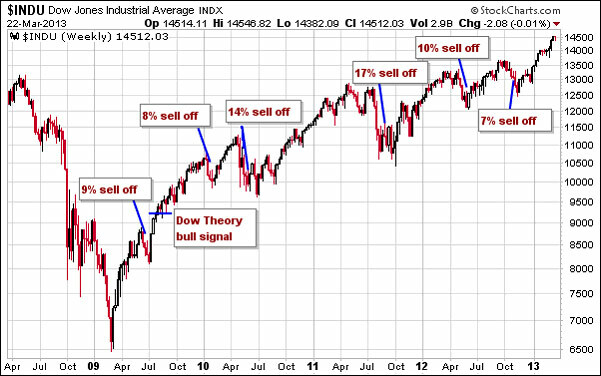 Other Dow Theorists don’t believe the market gave a valid sell signal in 2011. But in either case, both Averages made new highs in October, 2011, confirming the Bull’s dominance. Since then, despite rotten news and temporary non-confirmations, nothing has reversed or invalidated this as being a Dow Theory Bull market. Since bottoming in early 2009, the market has dropped by 7% or more on six separate occasions. Each drop was followed by the market soon rising to new highs. A decline of 8% seems all but inevitable, yet by itself would do nothing to change the status of this being a Dow Theory Bull market. Therefore, while an 8% stop-loss might be a good strategy for short-term, speculative trading, it is inconsistent with a Dow Theory investment strategy. Richard and I were talking about this, and – for subscribers who are not already in the market - it probably makes more sense to wait for a 5% or 10% decline in the market, buy at that point, and then place an 8% stop order. The corollary is that if you’re only willing to risk 8% (or 10%, or even 12%) here, then this market probably isn’t for you. And I think that’s been Richard’s point, borne out by my earlier work – this is Bull market, but not one for the faint of heart. For those already in this market, let me mention Richard’s old (and sage) advice to “sell down to your sleeping point.” In other words, if you have so much in the stock market that a 10% or 15% sell-off causes you to lose sleep, then cut back until your stock holdings allow you to sleep well at nights with such a decline. And then hold on as long as it’s a Dow Theory Bull market. But fair enough: What if you accept this risk and want to be in this market now – where should you invest? A good mutual fund isn’t a bad way to go, leaving the detailed buy/sell decisions to the pros. ETFs give us some other good options these days also. I’ve just studied 15 of the largest sector ETFs, meaning those exchange traded funds that invest in a particular sector of the market such as utility stocks, energy companies, tech stocks, etc. Three of them look rather over-sold (cheap, if you like) and are showing signs of perhaps turning up.